For the third consecutive time, Orcadian Highland Park single malt has been awarded top marks by leading US independent whisky expert Paul Pacult in his coveted list of best spirits in the Spirits Journal 2010. Commenting on hitting the number one spot, Gerry Tosh, Head of Brand Education, said: “Paul Pacult’s continuous support is a tribute to the hard work and dedication of our team at the distillery. Highland Park 18 year old is the whisky we are most proud of and it has received the most plaudits from experts and enthusiasts alike. “The reason, we believe, it wins more awards than any of our other whiskies is down to the perfect balance of sweet and smoke. We use 45% first-filled sherry casks, predominantly European, which gives that rich sweetness and aromatic Orcadian peat and a subtle, gentle smoky aftertaste. 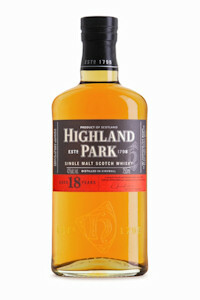 Highland Park 18 year old is available in Tesco, Oddbins, and specialist retailers or online at www.highlandpark.co.uk and at an RRP of £63. The stunning packaging complements the liquid and draws on Orkney’s Norse heritage; the design on the front of the oak box takes the form of the complex woodcarvings in the characteristic ‘gripping beast’ style seen on the Oseberg ship, the oldest and most beautiful vessel of the Viking age. The outstanding craftsmanship has provided inspiration for the design of the packaging of this exceptional whisky for today’s intrepid travellers. The Duty Free recommended retail prices are; 1998 Vintage €46 (1l), 1994 Vintage €65 (70cl), 1990 Vintage €99 (70cl) and 1973 Vintage €750 (70cl). The range will be available from April/May 2010. Single Island Malt Scotch Whisky for the Highland Park Distillery, Kirkwall, Orkney. This malts is an old favourite and has won many awards over the years. Would recommend this malt for everyone and is simply a classic. This 18 Year Old is a distillery bottling.